This weekend has been a fantastic one, Puerto Morelos Style! On Friday, Josh enjoyed golfing at the Moon Palace. They have a local's rate of $100 USD -- includes cart, golf, and all you can eat and drink. Meanwhile, I was on the hunt for baking supplies to make Christmas cookies. There are two stores in Cancun, that I know of, that specialize in baking supplies. I was able to find Christmas cookie cutters, baking chocolate, sprinkles, a rolling pin, and lots of specialty items at the two stores. One is called "CIM" and can be found in Market 23 in Cancun. The other is called "EuroBakery" and is on Av. Yaxchilan near Market 28. This morning we had a delicioso breakfast at Puerto Morelos' Mama's Bakery, before taking my father-in-law to the airport. Then, I spent the day baking Christmas goodies: Sugar Cookies, Buckeyes, Snickerdoodles, and Chocolate Dipped Candy Canes. I found great recipes online at: JoyOfBaking.com. Road Crews continue to work on Niños Heroes. They are almost to the end of the road with the scraping and leveling. Soon, both Niños Heroes and Andres Q. Roo will be ready for paving. No more pot holes!! Yeah!! 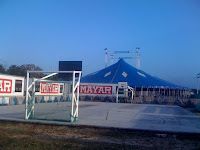 A circus, Mayar Brothers, has set up its tents in the baseball field of the Pescadores. I think I will take the kiddos tomorrow to scope it out! I will be adding lots of holiday events to the Community Events Calendar (see the bottom of this blog's page) in the next few days! If you are in town, there will be lots to do!